Preheat oven to 325, in a small saucepan, heat 1/4 cup honey and butter over low until butter melts. In a large bowl, combine oats, almonds, and pinch of salt. 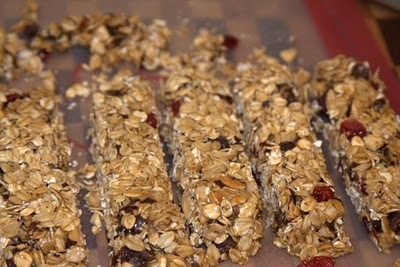 mix honey misture over oats to combine, add dried fruit and stir. Then on a roasting pan or large baking pan lay out this mixture and bake for about 10 minutes to toast the oats and almonds. Lightly butter bar pan as pictured or in a baking dish, in saucepan combine 1/2 cup honey, nut butter, and brown sugar over meidum. Cook, stirring occasionally until mixture comes to a boild and sugar dessolves. Mix honey mixture and the oat mixture and stir until combined. Transfer to baking dish, or bar ban. 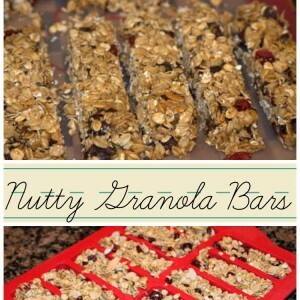 With spatula, firmly press granola into dish. 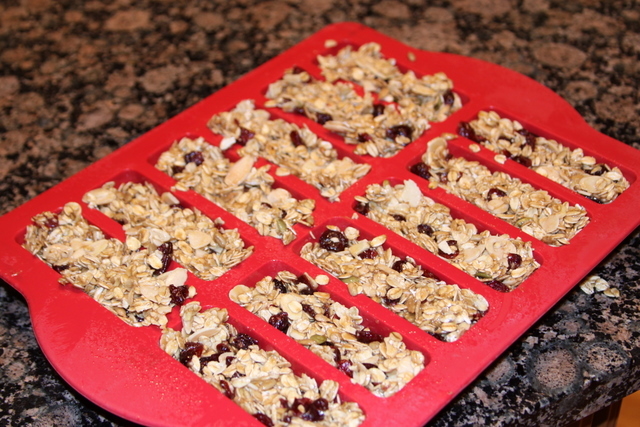 Refrigerate until firm, about 1 hour, then cut into bars or squares if in a baking dish. 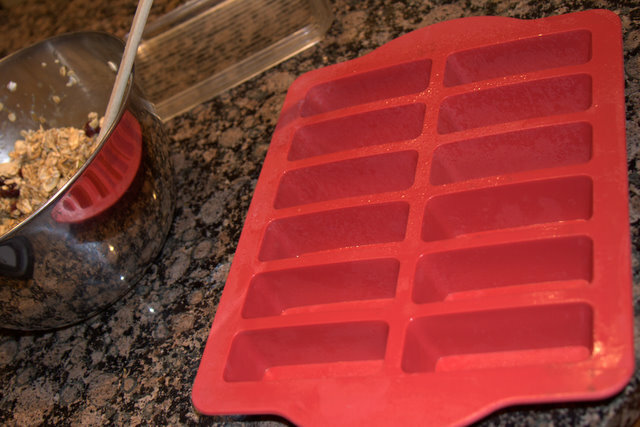 I just cover the bar pan and leave the whole pan in the fridge and pop them out when needed. . I have found this to be the BEST pan for these. 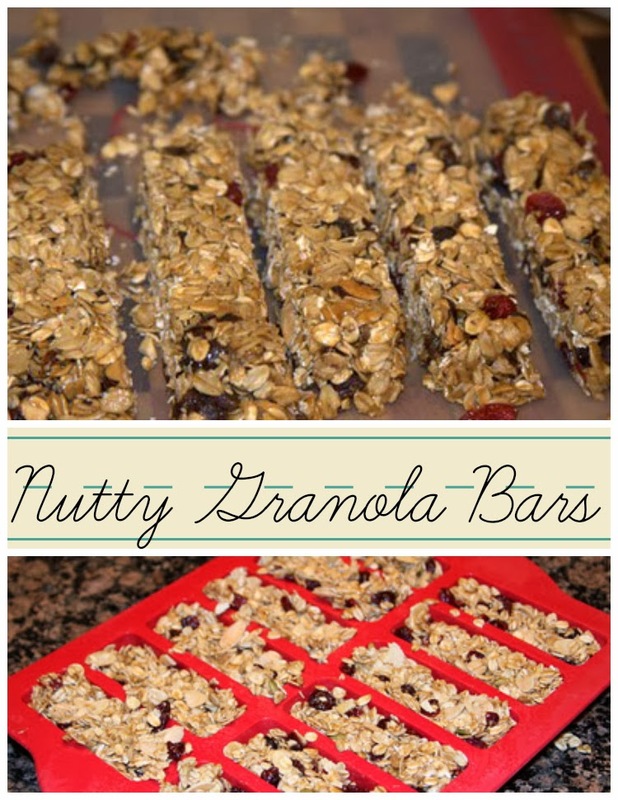 I make these usually a double batch at least twice a month. One batch fits perfect into one of these bar pans. I just put the whole thing in the fridge and pop out a bar when we need one.